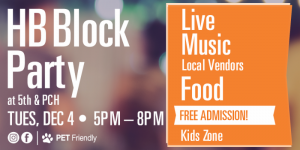 I will be at HB Block Party on Tuesday, December 4th at 5th & PCH in Huntington Beach. I will be sharing Gifts of Health that you can give to your love ones for the Holidays. I will have samples for you to enjoy. Come and check it out. It will be a fun event. There will be live music and a Kids Zone. It is a great way to enjoy the holidays.